Area S-17 is the seventeenth course of Rainbow Summit and the ninetieth course overall in Mario vs. Donkey Kong: Mini-Land Mayhem!. The level features eight Mini Marios, though not necessarily in the same starting positions. 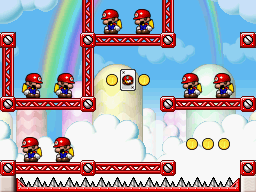 The Mini Marios all begin in groups of two revolving around the center, with the exit door on the top left. In order to reach it, they must simply be guided via a series of Red Girders and Warp Pipes to it. The M-Token is located at the top right, just above a Red Girder rivet. To collect it, a Mini Mario must follow two overlapping diagonal Red Girder platforms and eliminate the top left-bottom right one so that the Mini will reach it. The Mini Mario Card is located at the very center, on a Red Girder platform. A Mini Mario group must simply use Red Girders to reach it. In Plus Mode, the six Mini Marios must be guided to the exit door first, followed by the two Mini Donkey Kongs. This page was last edited on September 18, 2018, at 06:36.